New Latch Hook Kits at Weekend Kits! Latch hooking is a fun & easy craft to learn. Visit the Latch Hook Kits section of the store to see our new selection of latch hook rug kits! 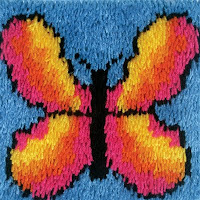 Butterflies are a popular theme for latch hooking and it's easy to see why! The colors are bright and the designs are interesting to latch. The finished size of the Mariposa Butterfly is 12" x 12". Caron latch hook kits include color-coded canvas, pre-cut rug yarn, complete charts, and illustrated instructions. Add a latch hook tool and you'll be ready to start latch hooking! Before starting your latch hook project, it's suggested that you cover the edges of the canvas with masking tape to prevent the edges from fraying or snagging. 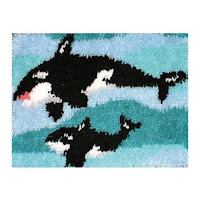 The Happy Orcas Latch Hook Kit is a latch hook rug design that appeals to all ages. No need to worry if you're a beginner, Caron latch hook kits include instructions on how to use your latch hook tool, including step-by-step instructions with diagrams. Finished size of the Happy Orcas latch rug is 15" x 20". Each kit includes a complete color chart, showing the appropriate color yarn to use for each square. In addition, the latch hook canvas is color-coded to match the yarn colors used in the rug design. This makes it easy to see when you're close to changing to a new yarn color. 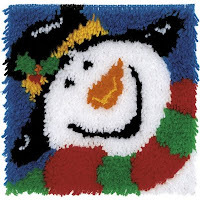 The Happy Snowman Christmas Latch Hook Kit is a fun latch hooking kit for the holidays! Latch hooking is a fun craft activity to share with others. Gather friends & family for a latch hooking party! There are a variety of options for finishing your latch hook rug project. You can create a fluffy pillow, decorative rug, or wall hanging. The first step to finishing is to trim the canvas to a 1-inch border around the hooked area. For rugs and wall hangings, latch hook rug binding is recommended for a more finished look. For a pillow, you'll need a coordinating fabric for the backing and a pillow form. When it's time to clean your latch hook rug, do not machine wash. Hand washing in cool water with mild detergent is one alternative. Dry cleaning is recommended by the manufacturer. See our complete selection of latch hooking rug kits in the Latch Hook Kits section. Kid's enjoy learning to latch hook too! Don't miss our fun selection of Krafty Kids Latch Hook Kits for kids from Caron. Weekend Kits offers a variety of craft kits for all ages to explore. Kits make it easy to learn a new skill and create something new. Visit today and be ready to start a new craft project on your next Weekend at Home! Visit the Seasonal & Holiday Kits section of the store to see our new selection of Bucilla felt Christmas ornament kits! Bucilla felt kits make it easy to create lasting handmade ornaments for your Christmas tree. Decorating the Christmas tree is a cherished tradition for many families. Sorting through the Christmas ornaments is like taking a walk down memory lane. Making your own felt applique ornaments is a creative way to add to your collection of handmade Christmas ornaments. 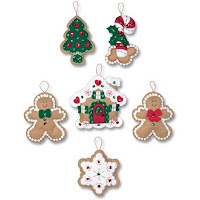 The Gingerbread House Felt Christmas Ornaments Kit includes stamped felts, cotton embroidery floss, sequins, beads, needles, and complete instructions. You'll create 6 classic holiday cookie ornaments with this creative felt embroidery kit. Ornament size is approx. 4" x 4". Each kit includes materials to make 1 gingerbread house, 2 gingerbread kids, 1 frosted star, 1 decorated Christmas tree, and 1 candy cane with holly sprig. The Teapots Felt Christmas Ornaments Kit includes materials to make a set of 8 charming felt ornaments designed by Mary Engelbreit. Each ornament is a unique teapot design. Ornament size is approx. 5" x 5". Mary Engelbreit's trademark style shines through in these whimsical teapot ornament designs. 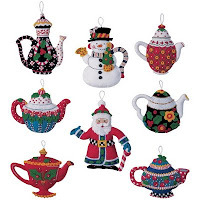 Each kit includes 6 fanciful teapots, 1 santa teapot, and 1 snowman teapot. Decorate your Christmas tree with these creative felt embroidery ornaments. You can also use them to decorate wreaths or to accent holiday gift packages. The Santa Felt Christmas Ornaments Kit, also designed by Mary Engelbreit, includes materials to make 6 Santa ornaments (2 each of 3 ornament designs). Ornament size is approx. 5" x 6-1/4". 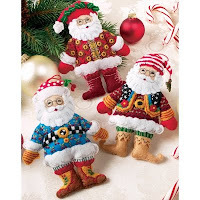 These old world Santa ornaments will be a festive addition to your Christmas tree decorations. Bucilla felt Christmas ornaments are made of quality materials and will stand the test of time. You'll want to have a pair of sharp craft scissors on hand for cutting out your felt pieces. Some of the felt shapes are very small and require precise trimming. It's worth investing in a good pair of scissors for this task. Once the holiday season is upon us, there's seems to be little time left for hand embroidery. Getting an early start on your felt Christmas kits ensures you'll be ready before the rush begins! Visit the Seasonal & Holiday Kits section for details on these kits and to see our full selection of felt Christmas craft kits. Shop at Weekend Kits today and be ready to create handmade Christmas ornaments on your next Weekend at Home! Mill Hill Beaded Cross Stitch Kits - New Designs! Mill Hill Buttons & Beads Kits are counted cross stitch kits that you embellish with glass beads and a coordinating ceramic button. You'll find our newest Mill Hill kits in the Seasonal & Holiday Kits section of the store. We've added three new beaded cross stitch kits from the 2009 autumn & winter series. It's easy to see why these new cross stitch designs are quickly becoming best sellers! The Christmas Collage Beaded Stitch Kit is a new cross stitch design from Mill Hill's winter series collection. Buttons & Beads cross stitch kits include glass beads, ceramic button, 14 count painted perforated paper, embroidery floss, needles and chart with instructions. Design is 5" x 5". Buttons & Beads kits include a unique ceramic button that complements the cross stitch design. Mill Hill's ceramic buttons are hand made in the USA. The Christmas Collage kit includes a red star button. Mill Hill Buttons & Beads Kits include 14-count perforated paper, painted a color that matches the design. You can see the paper color by looking at the outside perimeter of the design. The painted paper conveniently becomes a designer 'mat' for your completed needle art. The foundation medium is called perforated 'paper', but it's more substantial than regular paper. The perforated holes in the stitching paper are termed '14-count', which means there will be 14 stitches per inch. To ensure good coverage across the design, it's typical to use 3 strands of embroidery floss when stitching on perforated paper. Mill Hill cross stitch kits include a design chart with instructions specific to each design, including floss color placement and number of strands. The Fall Leaves Beaded Stitch Kit is a new beaded cross stitch design from Mill Hill's autumn series collection. It features a beautiful collection of fall leaves, embellished with color coordinated glass beads and a ceramic acorn button. Coordinating Mill Hill Frames are also available for purchase in the store. These 8" x 8" solid color wood frames come with a dowel for easy display on any surface, such as a table or mantel. Visit the Seasonal & Holiday Kits section for more details on these kits and to see our complete selection of Christmas craft kits. Have fun crafting for the holidays with Christmas cross stitch kits designed especially for the season! See our entire selection of beaded cross stitch kits, for any time of the year, in the Embroidery Kits section of the store. Learn everything you need to know at About.com's Cross Stitch Basics page. This is a comprehensive resource for beginners to get started cross stitching with confidence. Visit Weekend Kits today and be ready to start stitching on your next Weekend at Home!